Baahubali 2 Trailer Spoof: It’s here presenting! Baahubali 2 or Baahubali 2 – The Conclusion official trailer has been dropped upon us and oh my God, we are going bonkers. Everything about the trailer is GRAND. The Right from the visuals to emotions and of course those massive sets, it’s epic on so many levels that we literally lost the count. It was clearly worth the wait and everybody who has seen the trailer is going gaga about it. Here are the Best and worst reactions to the Baahubali 2 trailer. Watch Baahubali 2 (Telugu, Hindi, Tamil, Malayalam) Trailer. These days, a lot of people are uploading their trailer reactions. 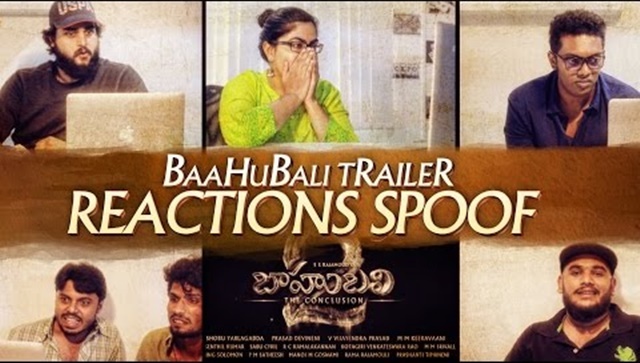 Here Check out few of those people React on the trailers. It’s just for fun.